The Lutron CW-2-WH Claro screwless wall plate, 2-gang is a decora style wallplate for light switches that have no visible screws. The benefit of this Lutron screwless is a wall plate with a sleek appearance since the screws that can be seen on traditional wall plates are hidden from view. The Lutron screwless 2-gang wall plate appearance is accomplished by using a two-part construction; a base plate is screwed to the wall and then the finish plate is snapped onto the base to finish the look. The Lutron CW-2-WH Claro screwless wall plate is designed to mount flush to the surrounding wall. The Lutron CW-2-WH is made with high-quality Thermoset, a very durable material that ensures your wall plate will look brand new for years. Cleaning fingerprints is quick and easy; a damp cloth is all you need to restore the wall plate’s luster. 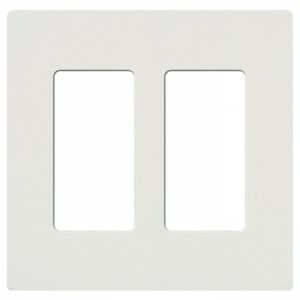 TheLutron CW-2-WH Claro screwless wall plate fits large toggle switches and dimmers of standard dimension. CSA International and Underwriters Laboratories (UL) have approved this fixture.